Rodhocetus Balochistanensis is an extinct species of whale that is believed to demonstrate an evolutionary link between whales and artiodactyls -- modern examples of which are hippopotamuses and pigs. 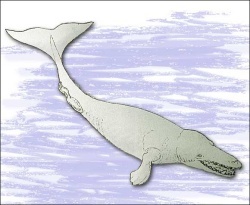 This has largely overturned previous fossil-based theories that whales were descended from mesonychids, though it matched studies of the genetic relations between whales and other animals. This claim is based on the structure of the ankle bones of this species, which shows peculiarites known only in artiodactyls, and their ear bones, which are particularly like those of modern whales. The first fossils of this species were found in Balochistan Province, Pakistan in 2001 by Philip Gingerich. Dating from about 47 million years ago, they are one of a series of recent discoveries, including the pakicetids, which have thrown considerable light on the previously mysterious evolutionary origin of whales.